← Welcome to Cuba Week! During most of my life I have lived outside of Cuba, as part of the Cuban Diaspora, yet my being continues to be rooted in the fertile island where I was born and where I lived as a child, an adolescent, and a young woman. In 1958, during the Batista dictatorship, my father’s dream of helping low-income families own their own homes was thwarted when the soldiers who had bought some of the accessible yet solid houses he had built with such care, refused to make their mortgage payments. Trying to find a solution, my father met with the garrison’s commander. Instead of support, he received a frightening threat that led us to flee to Miami. At that time, Miami did not have the Latino presence it has today. As I wanted to study Spanish and Latin-American literature, I begged to go study in Mexico City. I was fascinated by the artistic and literary achievements of post-Revolutionary Mexico. However, my parents did not feel comfortable sending me to a country where we knew no one. Instead, they suggested I go to Spain, where my mother had relatives. Spain became the third country where I lived. While the Franco regime imposed many limitations, I was immensely fortunate to be mentored by some extraordinary professors, Elena Catena, don Alonso Zamora Vicente, and doña María Josefa Canellada, who helped channel my thirst for learning. I will always be grateful for their teaching and their example. A set of unexpected circumstances led me to Perú, which became the fourth country where I lived. 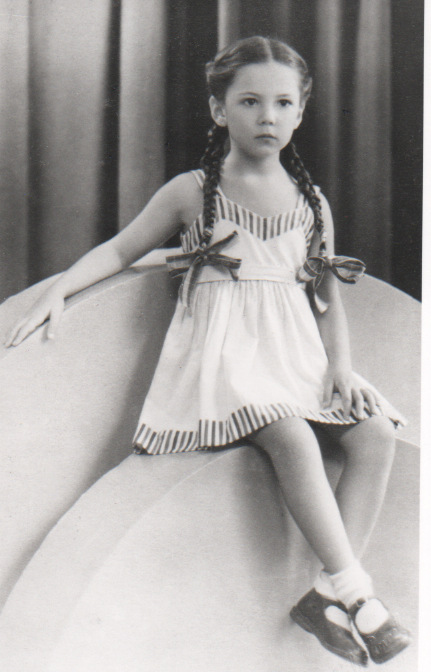 In Cuba, I had delighted in being my parents’ daughter; in Perú I became a mother. 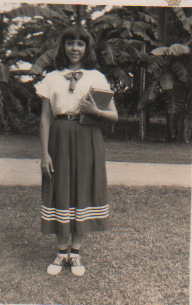 In Cuba, I had absorbed my family’s commitment to education; in Perú, I became a teacher. In Cuba, I had learned the key role of education in striving for social justice; in Perú, I studied Paulo Freire’s words and became actively concerned with social issues. While in Perú, I finished my doctorate degree. The topic of my dissertation led to an appointment as a research scholar at Harvard. There I experienced an exciting cultural milieu comprised of distinguished authors and artists who had left Spain after the Spanish Civil War, including the poet Jorge Guillen. Later, after two years in Lima, I returned to the United States with my children and became involved in several grassroots movements on behalf of social justice and education. Each of these four countries left a profound imprint on me, as I learned to understand their different worldviews, to enjoy their colors and fragrances, and to love their people. I also learned to rebel against the unjust social conditions suffered by many in each of these places, and also, to admire the resilience, fortitude and creativity of the majority of the people I met, wherever I lived. But always, as the backdrop to all these life experiences, my memories of Cuba continued to nourish my deepest soul. As a child, some of my best friends were trees. In the large overgrown gardens of the old historical house where I was born, many different kinds of living creatures inspired me to learn to observe and respect nature. Our colonial city was a microcosm of the larger world; there I learned to listen to those around me and reflect on what I heard. From my family, I learned the values of caring and compassion; kindness and generosity; friendship, knowledge, and justice. The overgrown gardens have expanded and today I consider the whole planet my home. I continue to marvel at its richness and diversity, including the daily miracles of flower petals and bird feathers. I especially attempt to not remain indifferent to any human experience. Yet, no matter how far my circle of interest may expand, I never feel far from my roots; on the contrary, it is through being nurtured by them, that I can open my heart to everything else. I learned about immigration from my own family. Both of my grandfathers had immigrated to Cuba from Spain. They each made great efforts to contribute to their new homeland and to defend freedom of thought. My maternal grandfather, Medardo Lafuente Rubio, used his talents for self-expression as a poet, public speaker, educator, and journalist to promote universal human values. During the despotic dictatorship of Machado, he was incarcerated for defending freedom in his newspaper. His time in prison greatly damaged his health and he died not long after his eventual release. My paternal grandfather owned a newspaper and also one of the earliest radio stations in Cuba. His words, whether written or spoken, always defended the value of free independent thinking that had been crushed in his county of birth by Franco’s dictatorship. 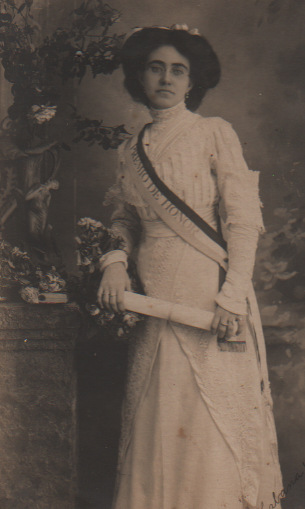 AFA’s grandmother at graduation from teaching school. 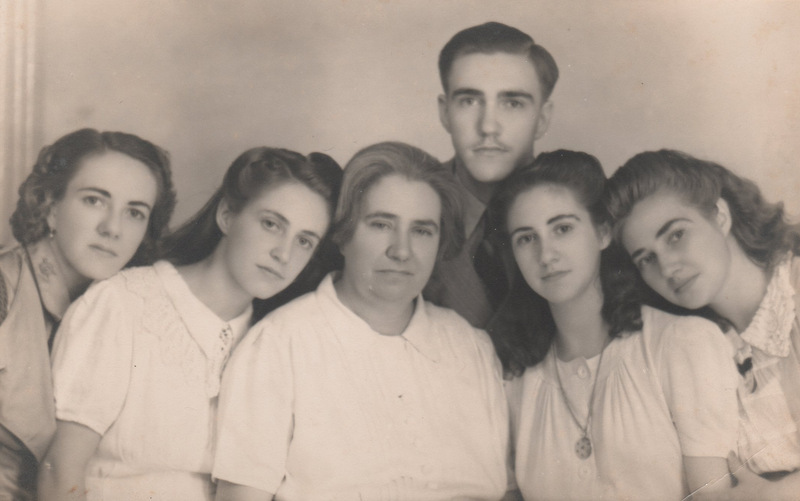 My maternal grandmother, Dolores Salvador, was the strongest influence in my life. Losing her when I was very young filled me with profound nostalgia. In response to the pain of this loss, I sought to protect and nurture my memories of her, as one would a tender plant. And thus I became a storyteller, sharing my stories again and again, sometimes orally, other times in writing, often in silence. The feelings arising from my own experiences have inspired much of my writing. Even one of my more recent books, Love, Amalia, co-authored with my son Gabriel Zubizarreta, is rooted in the memory of losing my grandmother. Another source of inspiration has been the desire to continue to savor my own children’s childhood. I often remind teachers to encourage children to write, as each child has a unique perspective to share. I am very grateful to an editor of The Hungry Mind who many years ago, asked me to contribute one real-life childhood story for his publication. In response, I wrote my first three real-life stories and submitted them to him. He told me kindly that, while he could only publish one, he wanted to encourage me to write a few more. 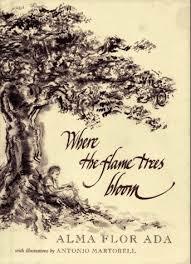 And thus, Where the Flame Trees Bloom was born. It took the additional encouragement of my dear friend Antonio Martorell, an inspired artist and illustrator, to continue writing the childhood memoirs that became Under the Royal Palms, and which received the Pura Belpré Medal in 2000. More recently, when Simon & Schuster decided to re-print both of these books under one cover, Emma Ledbetter, my supportive editor, welcomed the idea of also including some new stories from my growing-up years in Cuba. Thus Island Treasures has come to be. Like the mountain springs in Tope de Collantes, in Cuba, whose currents of clear cool water never stop running, all of our memories hold an endless number of sensations, feelings, faces, flavors, aromas, textures, and emotions, if only we are willing to turn inward, to welcome and honor them in some way. It is my hope that as I share my stories with you in Island Treasures, your own awareness of the people who have enriched your life and the moments that have helped shape who you are, will deepen. May you welcome and value your own stories as an intrinsic part of who you are, dear reader, while also rejoicing in who you have become. Alma Flor Ada has written countless books, most of which do not specify Cuban settings or characters, but which nearly always highlight Latino life. She is an author, educator, scholar, and internationally known speaker. Her life’s work includes advocacy for peace and social justice. A Pro­fes­sor Emerita at the Uni­ver­sity of San Fran­cisco, she is also a for­mer Rad­cliffe Scholar at Har­vard Uni­ver­sity and Ful­bright Research Scholar. 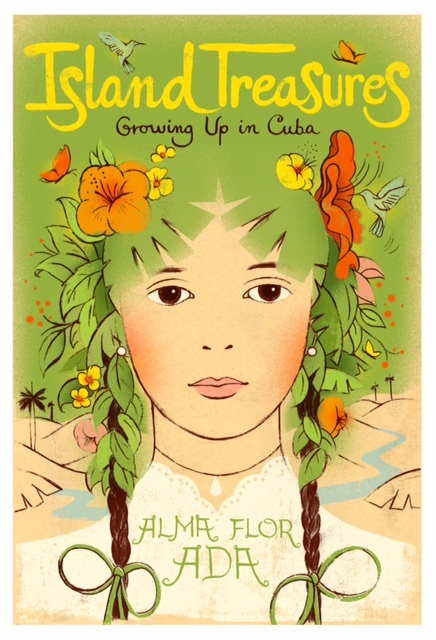 In the world of children’s books, Alma Flor is known for her poetry, narratives, folk­lore and non-fic­tion. She’s the recipient of many prestigious awards, including the Christo­pher Medal, the Pura Bel­pré Medal, the International Latino Book Award, and the Vir­ginia Hamil­ton Award, in recognition of her body of work for children. Learn more at her official website. Nicely done, Alma Flor Adad. Your books are always an inspiration and your commitment to promoting Latino literature in the US has been a godsend to all of us.